We look forward to nurturing the young talent in our community and providing them with early exposure to this incredibly exciting process. While ACT of Connecticut (A Contemporary Theatre) kicked off its inaugural year with the smash hit musical “Mamma Mia!” in June, July marks the start of the theater’s exciting summer programs. Ridgefield’s newly-renovated state-of-the-art theater will open its doors to young theater enthusiasts for two summer camp workshop sessions in mid-July. Working professionals from Broadway and Fairfield County will offer in-depth instruction to help students between third and 12th grade hone their acting, singing and performance skills. 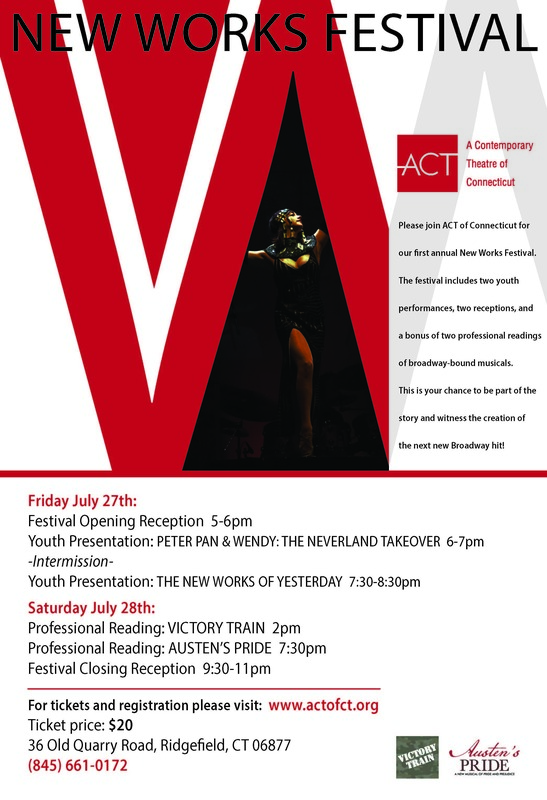 ACT of CT will also showcase its first annual New Works Festival at the end of July, giving community members the opportunity to witness the creation of the next potential Broadway hit. 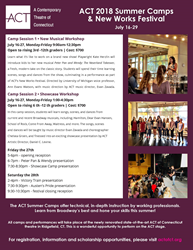 “We are so thrilled to be able to offer our community the chance to be a part of the creation of these new musicals and plays,” said Daniel C. Levine, artistic director, ACT of CT.
New Musical Workshop (July 16-27) – Students will learn what it’s like to work on a brand-new show. Playwright Kate Herzlin will introduce participants to her new musical “Peter Pan and Wendy: The Neverland Takeover,” a fresh, modern take on the classic story. Students will learn scenes, songs and dances from the show, culminating in a performance as part of ACT of CT’s New Works Festival. Ann Evans Watson (voice professor, University of Michigan) is director and Evan Zavada (music director, ACT of CT) will provide music direction. Showcase Workshop (July 16-27) – Students will learn songs, scenes and dances from current and recent Broadway musicals, including “Hamilton,” “Dear Evan Hansen,” “School of Rock,” “Come From Away,” “Waitress” and more. Evan Zavada and Chelsea Groen (choreographer) will teach this camp session and Daniel C. Levine will develop an exciting presentation for the New Works Festival. 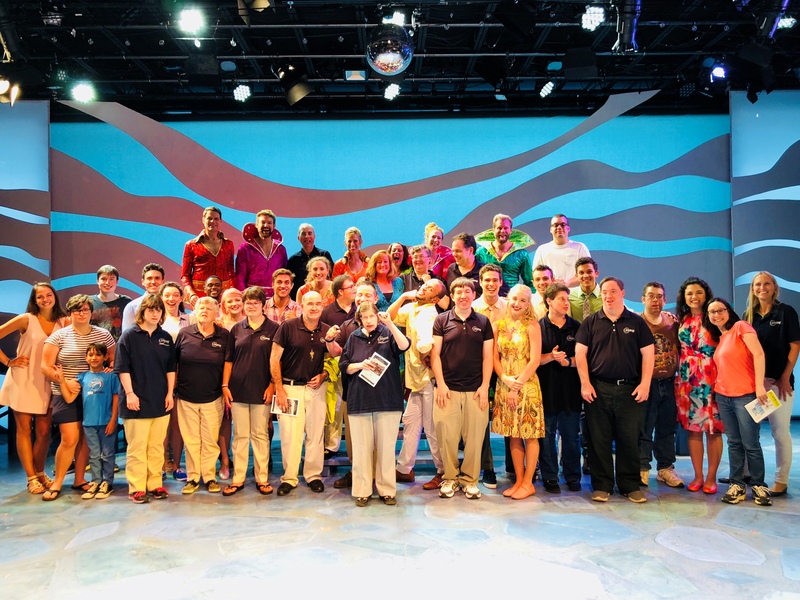 Beyond the summer programs, ACT of CT recently presented a special sensory-friendly performance of “Mamma Mia!” for individuals with intellectual and developmental disabilities, including those on the autism spectrum, and individuals with other sensitivity issues on Sunday, June 24. In an effort to promote a “judgement-free zone,” theater accommodations at this performance included lower sound levels, adjusted lighting and the removal of startling special effects. Tickets to the performance were free and available to the community on a first-come, first-serve basis. Registration is currently open for the theater’s summer camp workshops. To sign up for a session and learn more about the New Works Festival, ACT of CT, ticket and annual subscription sales, education programs, sponsor/donor opportunities and other theater-related news and announcements, visit http://www.actofct.org. ACT of Connecticut (A Contemporary Theatre) is a nonprofit 501(c)(3), premier Equity theater located in the renowned Schlumberger auditorium in Ridgefield, CT. Founded and led by three accomplished theater professionals, the contemporary theater presents limited engagement runs of well-known Broadway plays and musicals, as well as world premiere plays and musicals by the next generation of writers and composers. The theater company will produce four shows per season, each show featuring both NYC Broadway and local Fairfield and Westchester County talent. In addition to fully-produced main stage productions, ACT of CT hosts youth education classes, masterclasses, camps, workshops and a conservatory program for high school students. ACT of CT June 24th Performance of Mamma Mia!